You have decided to invest in a swimming pool to complete your backyard oasis. The vision of relaxing poolside with friends and family has been a goal for some time, and this is the year it becomes a reality. The first decision is what type of pool are you going to purchase and install? Do you want an above ground pool or an in-ground pool? There are advantages and disadvantages to both, not the least of which is cost. The first consideration is your backyard. If it is level and has easy access for large machinery and has normal soil composition, any pool can be installed. However, if the area you live in is solid bedrock, it may be impossible to dig a hole for an in-ground pool. If you have a significant slope to your yard, an in-ground pool may need additional soil and a retaining wall to hold it in place, or, if the cost is within your budget, it could be an opportunity to have an infinity pool. 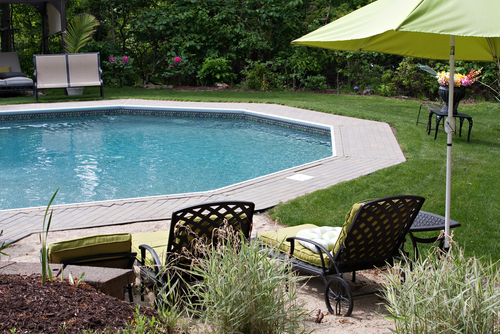 The size of your backyard can also determine how large your pool can be. Is your pool going to be an extension of your current patio or deck, or are you planning an above ground pool out in the yard? Are there obstacles which must remain as is, like a garage or tree, or are they removable like an outgrown play fort or an undesirable tree? All these are considerations when deciding what type of pool to install. The least expensive pool is the above ground pool. In fact, some of the big box stores have begun selling a “set and fill” version that is very inexpensive (usually between $100-$1000). The problem is these pools have a very short lifespan of 1-3 summers. The typical above ground pool is sold as a kit and costs between $1500 and $4500. The difference in price is determined by the quality of the pool you purchase and the size and shape of the pool. An oval pool will cost more than a round pool. The same is true for the installation of the pool. Your budget should include between $1000-$3500 for installation. You can lower the cost of installation by doing some of the work yourself. Your pool kit should include the equipment necessary to run your pool, including the pump, filter, and ladder. However, you will still need to purchase the tools, such as skimmer net and any cover for your pool, as well as test kits and chemicals. Don’t forget to check the municipal laws regarding fencing. Some cities require a fence around the entire pool, while others only require the access area to be fenced. Still other municipalities only require a safety ladder that pulls up out of reach and locks in place. If you have decided that an in-ground pool is the pool design you prefer, you will have some of the same concerns about where you want your pool to be placed in your yard. 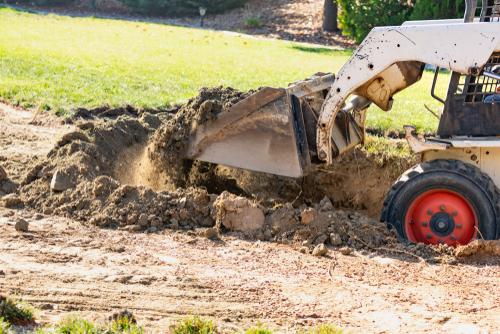 An additional concern will be the access to your yard of large equipment to dig the hole and, if you want a fiberglass molded pool, will it be able to be moved into your backyard or will you have to hire a crane to lift the pool over your house into the backyard? The crane will be an additional expense that needs to be accounted for in your budget. There are basically three types of in-ground pool with advantages and disadvantages to each, including cost. Gunite pools. A gunite pool is basically a concrete pool. The concrete-like mixture is sprayed onto a metal frame in a thick layer. When dry, the pool is finished with a smooth layer of plaster, or it can be tiled or covered with an aggregate type material. The gunite pool has a life expectancy of 50-100 years, but the finish layer will probably need to be redone several times. The gunite pool will require more expensive annual upkeep as well. Installing a gunite pool will cost between $35000 and $65000. Because gunite is porous, the pool is a bit more difficult to clean and maintain. This pool generally requires more pool chemical intervention to keep the pool in balance. Also, it will need an acid wash every 3-5 years, which basically removes a thin layer of plaster finish. That means your pool will also eventually need to be refinished. Fiberglass pools. Fiberglass pools are pre-molded to the shape and size and installed into the hole. A fiberglass pool costs between $20000 and $60000. The fiberglass pool has a life expectancy of 25 years or more. These pools are the easiest to clean and maintain. Vinyl-lined pool. The vinyl-lined pool is installed much like the above ground pool. After the hole is dug, a framework is built, and the vinyl is attached to the frame. The ground is then back-filled around the sides of the pool. These pools cost between $20000 and $40000. They also are easy to maintain; however, the liner will need to be replaced about every 10 years. This is only a starting point on your journey toward having a pool. There can be substantial differences in cost, depending on the region of the country you live in and the location of your site. It’s best to do your research to ensure you’ve budgeted for the present and the cost of the pool in the future.